Louis Leopold Block, from the Black Forest of Bavaria, arrived in the late 1880s in the midlands town of Camden, South Carolina, where his cousins, the Geisenheimer family, lived. He went into business with Jake and Gus Hirsch, and married their sister Rosa, six years his senior. Hirsch Brothers & Block grew into the biggest store in Camden. 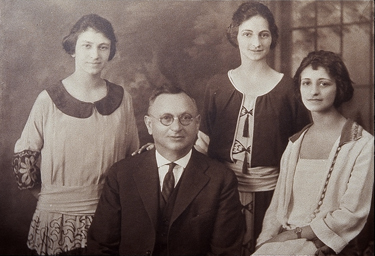 Between 1895 and 1900, Rosa and Louis Block had three daughters: Bella, Henrietta, and Rosalie Carolyn. Soon after Rosalie’s birth, Rosa Block died. Her place in the household was quickly assumed by another Rosa, Aunt Rosa Fried, who moved in to care for the girls and manage the help, which included a cook and a butler. When Aunt Rosa died in 1916, the girls’ cousin Theresa Block came down from Brooklyn, New York, and took over the role of surrogate mother. Theresa soon met and married Herman Baruch, a first cousin of Bernard Baruch on his father’s side and second cousin on his mother’s. In March 1920, Bella married Keeve Marks of Richmond, Virginia, and a month later, Henrietta married Lipman Rich of Orangeburg, South Carolina. Rosalie remained single, living with her father until he died in 1940, then splitting her time between her sisters’ homes in Richmond and Orangeburg.